The guaranteed return products like Bank Fixed Deposits (FDs) are considered safe and you will most likely get your money back in such instruments. However, the average inflation rate in India for 2012-2017 is around 7.25%. These days, most FDs give you about 6.5% interest before tax. This means, you are effectively losing money every year if you invest your money in a FD. In contrast, NPS has generated returns between 9.5% to 13% since inception in its different schemes of Non-Government sector. 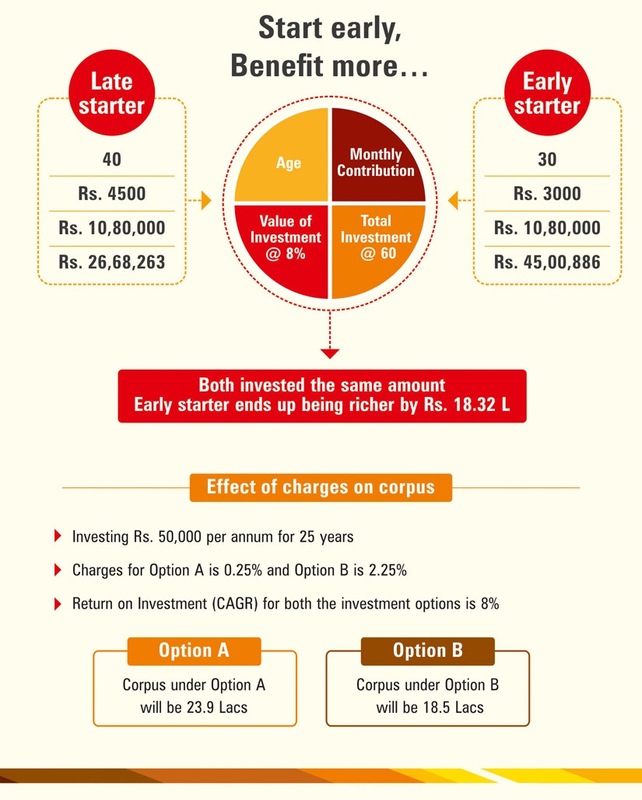 You may use the calculator given below to get an idea of pension corpus you may accumulate based on your investment objective. If we take one example of a person investing Rs. 1,000 per month for 25 years with a return of 11%, the corpus would be around Rs. 16 lakhs. Similarly, you can decide the investment amount, year of investment and rate of return to get the corpus estimation. Know the indicative corpus may be accumulated based on your investment objective. Early start always helps in creating bigger corpus. However, its never too late to start saving for your retirement. Based on today's terms & conditions, this chart will provide you indicative amount of pension you will get.